We’re proud to say that we are the only company to provide this amazing stag do weekend package. Not only in Yorkshire, but in the UK. Our unique location and facilities means that we can offer the best stag adventure doors, with everything on our doorstep and little or no need to travel. As we provide everything, it is incredibly easy to organise, book, and pay for adventure stag weekends with us. Just tell me how many are fortunate enough to be in your party and we will sort the rest! If you’re more interested in stag adventure days than a full weekend package, you can tailor your own activities using our stag and hen do calculator and select your chosen elements to build a bespoke package. Friday: Arrive from 1pm and settle into your bunkhouse for a two night stay. 4-6pm: Indulge in a home-cooked evening meal in the cafe or enjoy a BBQ on the terrace. 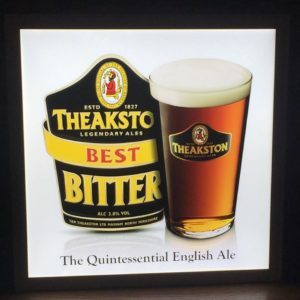 7pm: Set off on a Brewery Tour at Theakston’s Brewery in Masham. This tour and drinks is until 10pm that evening. Return transport is included and we’ll take you there in one of our minibuses, also collecting you once the beer sampling has finished! (If you’re still standing). Please note: the brewery tour has a minimum of 20 people or a minimum price of £232.50). 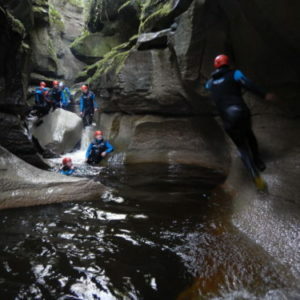 Alternatively, if you fancy something with a little added adventure during your adventure stag weekend with us, we now also have evening activity sessions. 9am: The day of adventure starts with a hearty full English breakfast including tea or coffee in the cafe, and then it’s straight out to start an exciting day of activities! 10am: You will meet your instructor and get ready to do the ‘Big Five’ full day activity package. You will start with the Via Ferrata and proceed onto Abseiling and Gorge Walking/Ghyll Scrambling immediately after. Lunch: After a jam-packed morning of stag adventures, we return to the cafe for a spot of lunch. A typical lunch includes Homemade Soup, a large selection of sandwiches and crisps, and soft drinks will also be provided. It’s important to stay hydrated to participate in the activities! 2pm: You your group will then spend the day canoeing along Scar House Reservoir before heading underground for an exhilarating caving experience. 6pm: After we have completed the Big 5, you will have time to get cleaned up and ready for an evening of sampling the night life in Harrogate. Our drivers will take you into town when you are ready and our latest collection time for return to your bunkhouse/accommodation is 2am. We recommend that you book somewhere for your evening meal in Harrogate if you have a big group. Morning: After a fun-filled stag weekend, you can head down for a taste full English breakfast when you’re ready. 1pm: Depart from your bunkhouse/accommodation. For more information on our adventure stag weekends, please do not hesitate to get in touch.